The secret of success is constancy of purpose. 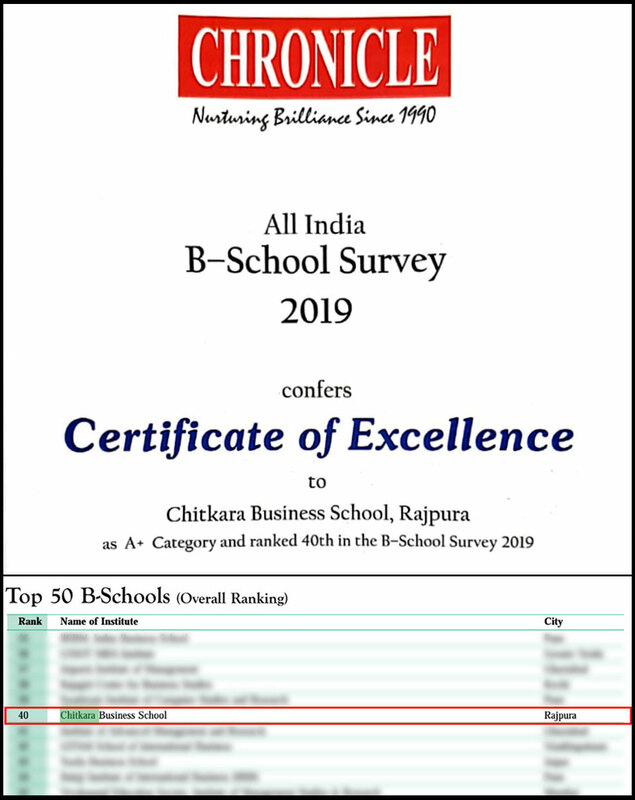 We are thrilled to announce that Chitkara Business School has been put in ‘A+ Category’ and ‘Ranked 40th’ among Top B-Schools of India, in a recent survey conducted by Chronicle All India B-School Survey 2019. Irrespective of how a management aspirant performs in the entrance exams, the dream destination to start a career in management remains the one and only – Chitkara Business School. Old or new, near or far, it remains the unbeatable choice for students seeking a successful career in the corporate world. With an excellent reputation for its world-class pedagogy and renowned faculty, Chitkara Business School has definitely carved out a niche for itself among one of the finest management and B-Schools in the region. The ‘Chronicle All’ ranking is indeed another feather in Chitkara’s cap. The survey based on inputs from management professionals, corporates, MBA aspirants and educators to prepare a credible and reliable ranking of the B-Schools in India. The ranking/rating is based on broad factors like Placements, Location, Infrastructure, industry interface and academic productivity. The ranking methodology is a tightrope to walk on, and the colleges and universities are ranked as per the cumulative score that they have received on the above parameters. The main focus of the B-School Survey-2019 is Placements. As per the changing scenario of the MBA education in India, weights of parameters had to be modified as some new attributes and sub-parameters like Social Responsibility, Entrepreneur Development and International collaborations were introduced keeping in view the new trends. The research team of Chronicle visited numerous B-Schools which have participated in the survey. The team interacted with the directors, faculty members, current students, academicians. The data was validated and different parameters were critically analyzed. Ratings on various parameters for each institute calculating importance of various parameters to arrive at weights for each parameter by using a regression model. Finally, the information collected corresponded to similar parameters as in the perceptual survey. A detailed scoring system was developed for each parameter. The final score for an MBA institute was an average of Perception Score and Factual Score – equal weight age (50:50) was given to both. Congratulations Chitkara Business School for yet another feat!